It's hard to find a candy I like more than chocolate covered salted caramels. (If you live in MN you have to try the Byerley/Lund's brand, they are to die for.) It's probably because I am such a fan of salty & sweet together (remember I'm the girl who put bacon on cupcakes & ice cream twice.) Then Ino at Kitchen 22 started talking about making cookies with this flavor on Twitter so I had to try it. And the results are pretty darn close to the candies. The cookies themselves are very chocolaty, almost fudge-like, since they have very little flour in them. The caramel bits stay nice & chewy, especially where they melt out of the cookies. Be generous with the salt on the top of the cookies as it makes for a good counterpoint to the sweetness. Really these cookies are quite decadent. 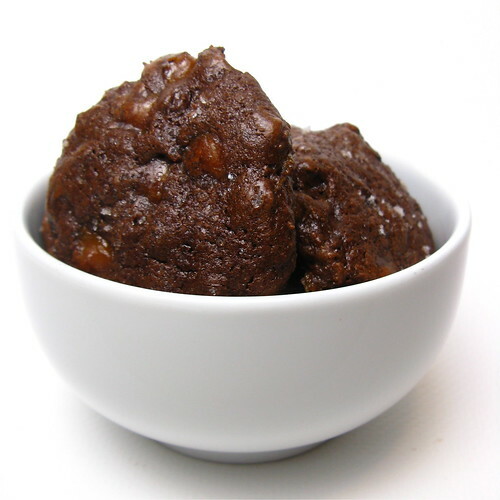 Melt 1 1/3 cup of the chocolate either in a microwave or double boiler. Stir in the butter until melted. Whisk the eggs & vanilla together. Quickly whisk in a little of the melted chocolate to temper the eggs. Add remaining melted chocolate & brown sugar then stir until completely mixed. Stir in the flour & baking powder, mix well. Fold in the caramel bits & remaining 2/3 cup chocolate chips. Refrigerate for at least 2 hours or overnight. Scoop batter by heaping tablespoons onto a baking sheet that has either been greased or covered with a silicon pad. Flatten the cookies slightly. Sprinkle each with salt & press to make the salt stick. Bake for 15 minutes. Let cool on cookie sheet for 10-15 minutes (you want the caramel to have a chance to set before moving the cookies) then cool on a rack. I get cravings for salty/sweet too, so these are definitely going in the "must try" category. Oh wow, great flavors--as always! You have the best flavor combos around. Would love to dig in to these! OH Elle...you out did yourself with these. How deliciously decadent they look and so rich and chewy. A perfect cookie! 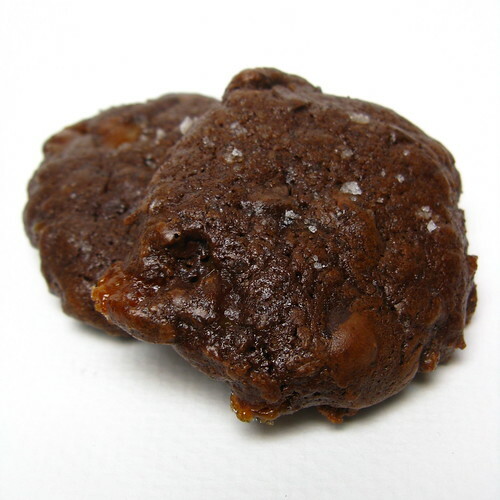 I love chewy and dense cookies. These look great! I'm so excited for the cookie posts! This one is such a good one to start with. I'm loving salted caramel too. Huge fan of sweet and salty and I love when spicy is thrown in too. I'd love to try this recipe, but I'm not sure what you mean by "caramel bits." Where do I get those? Chocolate and caramel? You would think I'd had my fix of sweets after eating through my kids' Halloween candy, but I may have to whip up a batch of these over the weekend. I have never had a chocolate salted caramel! I'm missing out! I just found your blog and after seeing these cookies, I think I'll stick around :) I love fudgy cookies! Those cookies look great. I could eat all 36! I love salted caramel, so I'm sure I'd love these! how about if i sprinkled some salt on a riesen chocolate chew--do you think that'd be a good imitation? :) i love riesens and i love salted caramel, and these cookies are absolutely decadent. great inspiration and great results! I clicked over here via FoodGawker (couldn't resist the cookie photo!). I'll have to stop by Byerly's when I'm home for Christmas to pick up some of those carmels! I am a native St. Louis Parker moved to West Virginia, but am still a Minnesotan through and through! I am going to like your blog!! Oh dear - these are fab! Silpat is definitely the way to go! They sound really good! I've never seen caramel bits in the shops here - I must hunt some out! I would love those small burts of salt with each bite...nice one! This is so wonderful.Ive been following your 8 weeks of cookies and this was the first I tried to make! Thank you for sharing this recipe! Hey Kat, I am making these cookies right now but I just realized I don't have fleur de sel :( Do you think I could substitute with kosher salt?? Oh I am so glad to see yet another use for my new favorite baking item this year. (Caramel bits) I have been playing with all kinds of recipes. Yesterday I put them in my brownies and they were so yummy! I will be making these today since I have plenty of these bits on hand. Thanks for the recipe. Out of all the 8 weeks, these are my favorite! Yum! I stumbled across your blog from your great Taste Spotting photo and had to make these cookies. Unfortunately, this was probably my biggest baking fail so far! Your cookie photos are GORGEOUS and my cookies were sticky, soupy messes! I could barely get them off the sheet and followed the directions exactly. How did you get them so pretty and.. solid? Twentysomething - What a bummer! I've made the chocolate base to these cookies a bunch of times & never had a problem. Did you chill the dough long enough?